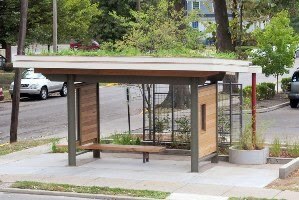 “Gardenstop” incorporates living plants, and features native vines growing on a metal screen backdrop, a green roof to divert storm water runoff, and other sustainable features including a greengrid modular roof system featuring locally grown plants; a roof framed with salvaged and antique white oak beams; ceilings featuring reclained yellow pine tongue-and-groove flooring salvaged from demolished Lexington-area houses; reclaimed metal barn roofing from Franklin County; and native sassafras harvested in surrounding counties. The East Wall panel is framed in poplar from the demolished Morton’s Row on Upper Street. The West Wall is framed in reclaimed cypress from the bourbon distillery process. The Art in Motion pilot project began as a national design competion and “Bottlestop” (incorporating local Ale 8 bottle glass) was created on Versailles Road. For Gardenstop, Art in Motion worked with partners UK, LexTran, Aylesford Place Neighborhood Association and the LFUCG planning division to hold a public design contest. The winning design by Prajna Design and Construction was chosen from over 17 entries from design firms and other professionals. Prajna donated time and services to the project and recruited materials from local business such as Michler’s Greenhouse, Grant Logan Copper, Janell Concrete, Congleton Lumber, Kelly Nurseries and many others. Additional funding was provided by LexTran, Art in Motion, and the University of Kentucky. Speakers at the dedication will include Bob Wiseman, UK Vice President for Facilities Management, Garry Murphy of Prajna, Rocky Burke of LexTran, Claudia Michler of Michler’s Greenhouse and others.